Designing sustainable buildings across our global operations to minimise our environmental impact. Our new building in Ware, UK, needs carefully controlled ambient temperature and humidity to store pharmaceutical samples. The building design makes it resilient against outdoor temperature changes, while minimising environmental impacts. The 200m2 of solar panels on the roof generate twice as much energy as the building needs, feeding the rest back into the grid. Inside, the rooms have plenty of natural light and ventilation, heated by the sun through clever building design. Hot water comes from an on-site combined heat and power plant. This is our most innovative building design to date and continues the transformation of sites across our global network. One of our US regional operations hubs in Philadelphia was awarded LEED Platinum – the highest rating from the international green buildings certification – and uses just 70% of the energy of a traditional building. At our state of the art factory in Bangalore, India, solar panels will generate over 500kW of power and will discharge no liquids. 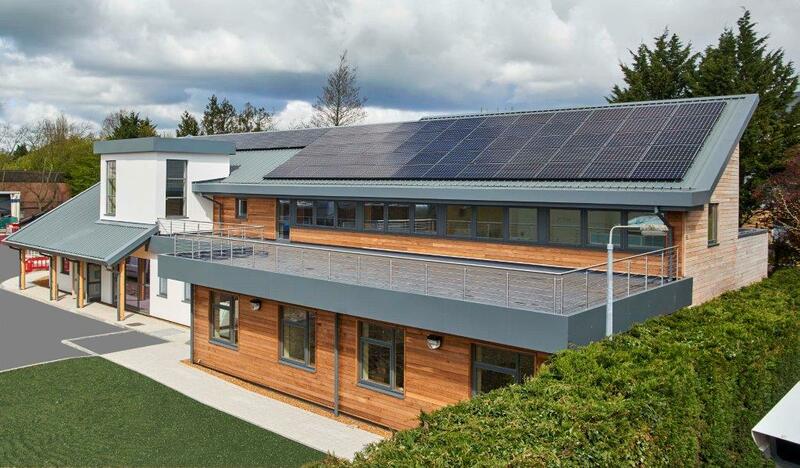 As we learn more about how sustainable building techniques can be used for industrial purposes, we are putting this knowledge into practice with similar projects in the UK, where GSK funding led to the construction of the country’s first ever carbon neutral laboratory in Nottingham.